You don’t remember telling Safari what you wanted because its default choice didn’t get in your way, and you never bothered poking around. Isn’t that the way things are supposed to work? And if you had bothered to find the obvious place (Safari’s “Privacy” settings), it couldn’t have been much more clear. I’m not getting into Flash wars here. More soon on all this but I’m on vacation! That’s wise, not to get into a Flash war, since the war is over and Flash lost. Apple was proven right on Flash, I suspect they’ll be proven right on default browser settings as well. If you didn’t want to talk about flash you shouldn’t have brought it up. Sounds like you just want to use flash to cast aspersions towards Apple. Not exactly, but fair point. I was angry when Apple made that Flash move. It felt arrogant and wrong. Why not let users chose? Okay, so it is okay for Google to assume the opposite of what the settings are by circumventing them? I’d prefer Apple to error on the side of protecting MY data, and let me shut it off, if I so choose. That is much more preferable then Google assuming I WANT to leak my data to them. Hmmm. I understand what you’re saying. My point is that I know and understand how things work on the “regular web” – and I know how to opt out. i didn’t know that Apple was blocking that in Safari. Most users, don’t know. Blocking third party cookies by default is the right thing to do, since most users don’t even know who these third parties are, or what they are doing with our information. I’d rather Apple error on the side of protecting my data, and let me choose to allow third party tracking if I choose? This is much better than Google and others making the choice for me that I want to share my data with them. You’re not really thick-headed, are you? For a smart man, this is a really dumb article. No-one who uses Safari is prevented from changing the default. It isn’t Apple’s job to assist Google and others to make money from us via third-party cookies. Basically saying that it is makes you sound like a shill for Google. Just trying to disentangle the newspeak here… I presume that by “Open Web” you mean “being trackable by Google”, and by consciously and intentionally restricting opting out of this tracking I’ve exiled myself to some “non-open” ghetto? Would an Android user who similarly opts out of cookies (if they are even given the choice) also be dropping out of this “open web”, or is it an Apple-only thing? I love how you’re trying to make it sound as though motives are relevant or even determinable here. Does it matter why Apple took the step of blocking third party cookies? Not really, not even if it was done to attack the competition (although considering this has been the default setting in Safari since before Google and Apple were rivals, I think your cheeky little musing on why Apple did this is pretty unsubstantiated). EVEN if the cookie-blocking has less than saintly motives, though, the outcome of greater privacy for users is the same. And if you’re arguing that most Safari users, if they had the whole sordid business of cookies explained to them, would elect to allow ad networks full access, you’re plainly deluded. The business model that assumes by default that uninformed users don’t (or, more worryingly, SHOULDN’T) want privacy is a business model that needs to die. Broken, just like mobile Flash. And remind me – what happened to mobile Flash? good article but I think you are missing the point. once privacy settings are in place, google and other should honour these settings! that’s the main difference, this isn’t about apple vs google, this is about google agains privacy settings. I’m happy with default settings to be ‘block 3rd party cookies’ and that’s the setting I use in other browsers. When you close a car door, it normally doesn’t lock. Apple built a car door that, by default, locks when you close it. Google has a habit of rifling through unlocked cars for information. When encountering an Apple car with a locked door, Google picked the lock and rifled through the information. 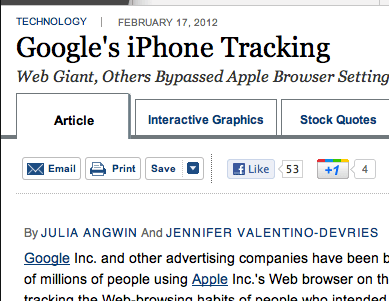 So Apple tried to prevent Google and others from tracking users, and they’re the bad guy? Oh I don’t think so. Google decided to write code to override the USER preferences. How much is Google paying this guy?? I mean, get real. How exactly do you define tracking? Nuance seems to get lost anytime Apple is called into question. Loss of Nuance? This article is about default browser cookies settings, and you brought up Flash. You accused Apple of not participating in the “open web” with no explanations about what you mean by “open web”. The fact is very simple: Google overrode a setting that was suppose to prevent this type of tracking in order to do this type of tracking. In fact, Google’s whole premise that this was done, so Google’s 1+ buttons would work is not even true. The only thing Google couldn’t do is track me as I go from web page to web page. Apparently this was important enough for Google that they purposefully found a way around this type of security. I agree about the open web question not being defined in the article, though I’ve written about it a lot on this site. My bad. And I agree Google did something that seems wrong on its face. As I said, I have not done what I think most should do – speak to the accused party and hear them out. I think I’ve proven in these pages over the years that I call Google out quite a bit. And I will again should I find their explanation lacking. I’ve not been monitoring this story for a week due to a planned vacation…give me some time, I promise to do my best to give a thoughtful follow up…. Based on your blog, and your follow-up comments where you don’t really acknowledge the points made by the readers, but imply you know more, but just haven’t found the words yet… I think that The best you can do in a “thoughtful” follow-up will be to sidetrack us further with some other allusion, like Flash (face it – with Flash, you’re flogging a dead horse and it isn’t even in the same race). I’m disappointed to find that it has just been FUD. Now it’s your turn to say I’m close-minded and you have the truth. Wow, that’s some serious FUD. Spin, spin, spin. So Google does bad and you somehow want to make this out to be Apple’s fault. Your a joke. So Apple’s default setting in Safari goes against your financial interests, and now you’re upset and defending actively going around people’s privacy settings. I was not driven by “financial interests” though I certainly acknowledge why you might think I was. We all are in some way or another, but I wrote that post over a week ago because I was questioning Apple and the Journal’s motives. I accept that you question mine, I get it. I really believe there will be better ways to deliver marketing messages than what we’ve got now. I worked for six years at FM trying to do marketing differently. And the company is still committed to that. Don’t just judge and dismiss me. I wonder if you have read my thoughts on a data bill of rights? Or followed my years-long call for and defense of an individual’s control over his or her data? It’s as if you assume I am incapable of listening, thinking, learning, nuance. And if you believe Apple isn’t driven by financial interests, you’re really not paying attention. You are scaring me, Mr. Batelle. You keep bringing Apple into this when everyone here has shown clearly that your arguments on that front are specious. Then make little allusions to “we don’t have the full picture” and now questioning if we are still open-minded if we have inevitably reached the conclusion that somehow you are shilling here. It is very manipulative… And face it, your ‘arguments’ and comparisons and red herrings like Flash show me that you are someone who cannot be listened to. Maybe what you are trying to do is distract us long enough to not reset our default “Apple is Bad, Google is Good” programming setting in our brains. Maybe you missed part of the problem with this controversy, I and most other people who want to protect our information change the browser settings on our computer to only allow 1st party plugins. But Google decided to bypass that system so they could better track my behavior. That’s not disturbing to you? I expressly chose not to have that happen and these arrogant fools decided to just bypass my settings. You sound like you’re shilling. Read the post please. I had not, and still have not spoken with anyone at Google about this. I have been with my family all this past week on vacation. I plan on getting smarter on this and I’ll write more. I’m not shilling. I called Google into question in the post. It sounded wrong to me what they did, and I said that. Once I understand all points of view, I’ll share mine again. It appears you didn’t talk to anyone at Apple either but that didn’t stop you from spending most of this post trying to shoehorn Apple into this issue. Incorrectly it seems. I’m sure you aren’t shilling. But Google runs an ad network, you run an ad network. I’d love to talk to folks at Apple. Any insights on how I might? But really my main point was the majority of your article was trying to make Apple at fault or bad in some way with little research and soft pedaling Google. Interesting. I had decided that I didn’t care about this and I didn’t think it warranted an investigation by the DOJ. But after reading your shill article defending Google I’ve changed my mind thanks to the good commentary here. If Google made an agreement to not falsely represent their privacy policies and then was caught lying about it in regards to Safari, then that changes things considerably. Bring on the investigation. You don’t make any sense here. I KNOW that Safari is set by default to disallow third-party cookies, and I WANT it that way, so I PURPOSEFULLY don’t change anything, because OUT OF THE BOX Safari acts the way I want it to. So, I don’t understand what you’re implying here; that because Apple is being proactive about my privacy, that’s bad? Ads a annoying; targeted ads are even more annoying; I don’t want them. So Apple is helping me out here. You’re suggestion that since these things are set by default means that, what, I have to turn that setting off and then back on again, so then *I* have enabled that setting? That’s stupid. You’re argument here is pro selling my info so advertisers can make more money off of my every move. No. Apple hasn’t done anything wrong; you’re suggesting a world where increasingly the user is bad for not allowing everything about me to be sold and used to throw more and more crap in my face. That’s wrong. I prefer to think the world will evolve to where you control not just “off or on” but what data, when, and how it might be used. I’ve written about this alot on this site. Lucky for you that day is here. You can set your browser to accept all cookies, just from sights visited, or all. If you think we should have more choices than that, I think we need to get advertisers to respect our privacy choices first no matter what the defaults are. The level of delusion exhibited in this post is fascinating. To the extent that this article is not stupid it is evil and to the extent that it is not evil it is stupid. I would say that it is willfully obtuse in which case it is both. When Apple sets a default setting to protect user privacy it is “paternal” and therefor somehow nefarious. But when all the other browsers set a different default setting, one that is financially beneficial to you and detrimental to the users’ privacy then it’s fine? That is what you imply here. So I say to you, Really? Supporting the open web means obeying the open specifications for how the web is supposed to work. That includes cookies. Apple does that. But somehow Apple has been nefarious and paternalistic because once again they chose a setting that favors their customers privacy over your paycheck. Really? Google’s culpability here is in some way mitigated and their actions more understandable because Apple somehow broke the “open web” by changing a default setting? Really? Somehow in your world, besides your own personal choice of default privacy settings, the “open web” also must include a completely proprietary technology that is also notorious for making it easy to compromise the privacy of people browsing the web. I really don’t care why Apple sets that setting the way they do. The fact is that it defaults to protecting my privacy and that is a good thing. I am aware of the implications of that setting and I very consciously leave it alone. For me it is a choice. And yet Google violates my intentions just the same. I don’t care how it interferes with your business model. Apple has been moving the needle towards user privacy ever since Safari 1.0 and if history is any indication the future will more likely than not include all major browsers blocking 3rd party cookies as Safari does now. When someone who can write in complete sentences writes something this inane about a hot topic it tends to garner a bit of attention. I can only hope that the sheer stupidity of this article is put to good use by alerting the general public that other browsers have default settings that provide less privacy than Safari, thus pressuring MS and Google to follow Apple’s lead. If that happens you will have done a valuable service to the public. Thanks – even though your tone is rather dismissive, I think perhaps you have made a point to me – I have not been clear enough in what my objections are with regard to Apple. I have more work to do. I’ll try to do better. And you certainly know very little of the company I started (or my own decades of other work) to make such statements about my motivations. But, that’s the way of the open web, and I embrace it – anyone can say anything, and anyone can be ignored, or listened to, on the merits. I’ll keep listening. The only part of this particular story that concerns Apple is the hole in its security. I don’t want Google(or your ad network) to track me with cookies. It’s disheartening to see you seem to prefer that people should have to opt out of your business model than opt in. It’s really tough not writting a flame response here(as you noticed from other posters I’m sure). I’m tempted to quote comedian Bill Hicks’ bit on advertisers. It’s a tad harsh(heh) but posts like yours remind me why I enjoyed that guy so much. I’ve been waiting for your update but It will probably just make me more mad. You said you haven’t been clear about your objections to Apple. In a story about Google exploiting a hole in browsers? Yet lack of knowledge didn’t stop you from ascribing nefarious motives to Apple. Even if those default privacy settings were there in versions of Safari predating both Google’s dependance on third party cookies and Google’s current feud with Apple. Could Apple have put them there because having the most consumer friendly browser (by, amongst other things, caring about their customers’ privacy) would be good for business? Well, wonder not more. I’ll tell you when. It’s when I decide upon the setting. Apple took the middle approach: From Third Parties and Advertisers, rather than the extreme: No Cookies, or All Cookies. Seems all the other browsers choose All Cookies as the default. Mmmmm. And you think that is good, better and best? I could have chosen No Cookies or All Cookies (which is the automatic choice from FireFox, by the way) but I chose to stick with the middle road. I made that decision after checking out Preference when I first started using Safari just as I changed the default setting in FireFox that allowed (without giving me any choice) any and all cookies. To repeat, what you get from FireFox and others is All Cookies, which is what I guess you consider “Standard” web practices. That isn’t choice anymore than what you claim is a lack of choice from Apple. Apple’s decision is as democratic as the others and far more likely to be the once most users who bother to be in the know, would choose. Are you an Apple hater or did you just fail logics course in high school, John B. Not a hater, probably failed a logic course. When I get through all the hate directed my way, I’ll try to post a reasoned response. John, if you were capable of a reasoned response you wouldn’t have written this article in the first place. What you’ll post is another set of poorly thought out excuses.